We stayed in the Old Quarter of Hanoi … in an area that never sleeps. We were there for a few days before our Halong Bay cruise and Cat Ba adventure and a few days afterwards. I enjoyed the city. A perfect example of liveable organised chaos. Hanoi is a hectic, fun, a city with a spirit and a soul, hard working and entrepreneurial. Hectic traffic is a feature. There are no rules enforced, traffic lights are just a suggestion, road directions are flexible, there is obvious overloading, emission control are mere words. There are rules somewhere but not out on the streets. There are 5 million motorcycles in a city of about 7 million people. With very few enforced rules traffic becomes like a flooded river flowing wherever it can. Sidewalks are motorcycle parking areas, food stall extensions or non-existent. The remaining walking space uneven or under repair. There is also a great love for fresh flowers which you see all over the city. The street food is plentiful and varied. The roads around the lake are closed to traffic from Friday evening to Sunday night. The hectic streets make peace with the population and provide a safe place for people to enjoy the lake and the many attractions and events that take place in the streets. The area is filled with fun and enjoyment. People of all ages taking a refuge from the mayhem outside. Groups enjoying skipping with double ropes. Buskers playing anything from a nose flute to a violin. Youngsters break dancing. 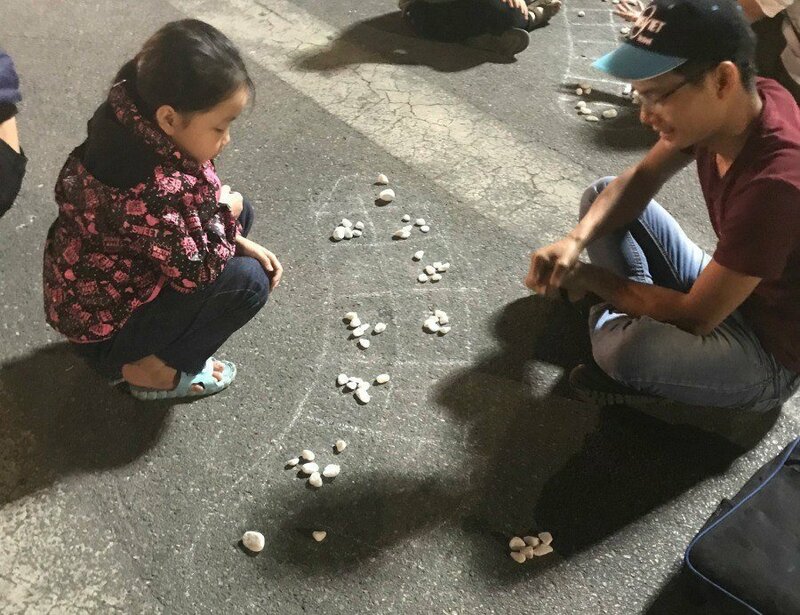 Young and old playing games with stones and boards drawn on the road. Children building with blocks of wood. Ballroom dancers and others doing Latin American dances. There is something for all ages and interests. Carefree happy environment …. no motor bikes!!!! The city has many varied options for people with different interests. Over the days we visited a number of places that resulted in a number of very mixed and different emotions. A magnificent church situated close to the historical Hoa Lo Prison. The prison is the site of disgusting abuses by the French during their occupation. It is another example of man’s inhumanity towards their fellow beings. The French colonialists used brutal savagery when it came to controlling their colonies they were exploiting. After the French occupation ended in 1954 the prison was used for people who broke the law. From 1964 to 1973 it was used to incarcerate American pilots who had been shot down during the bombing of North Vietnam. Based on the reasonably compassionate treatment meted during it came to be known as the “Hanoi Hilton”. We arrived here to find hundreds of tourists milling around. The mausoleum was closed. The embalmed body of Ho Chi Min is returned to Russia every year for restoration and it was late in being returned. The area around here is beautifully manicured and there are wide open spaces. But - do not dare to cross the yellow line running in front of the mausoleum or you’ll incur the stern rebuke from one of the many guards. It was interesting to follow the history of Vietnam through their conflicts with the French and then the Americans. My thought was that it should have been clear to the Americans that they had little chance in a war against the Vietnamese. They had the support and backing of both Russia and China. And over the last 1 000 or so years had defended their country against invasions from China, Mongolia and Thailand. It is fascinating to see history from the “other side” and realise that the truth is not what you’ve been led to believe. This area is a hectic assault on all your senses as sights, sounds, smells and tastes smash their way into your body. There are hundreds upon hundreds of tiny stalls crammed with stock and more being delivered every moment. Food stuff, fabrics, clothes for men women and children, jackets, socks and underwear come tumbling out. Sack after sack of deliveries. People with simple trolleys making their way down narrow passages, past customers and passers-by. Who knows how they ever know which little cubby hole they have to make the delivery? The market starts close to Hoan Kiem Lake and stretches along Hang Duding past the Dong Xuan Market to Hang Dau Street. Every Friday, Saturday and Sunday nights stalls are set up and the market begins. Food stalls are popular and sell many Vietnamese favourites. It is great fun to stop at these and try anything that takes your fancy. Hanoi has many beautiful buildings, unfortunately with many badly maintained. The city has a vibe and a spirit. Hoan Kiem Lake over the weekend is a memorable place.